During the month of March, Border Patrol agents apprehended 53,077 FMUAs — mostly in the Rio Grande Valley and El Paso Sectors. In addition, agents apprehended another 8,975 Unaccompanied Alien Children (UAC). Border Patrol officials define a family unit as one adult parent or guardian traveling with one or more minors. One year earlier, agents apprehended only 8,875 FMUAs and 4,140. In March 2017, agents apprehended 1,126 family units and 1,041 unaccompanied minors. The nearly 190,000 migrant families apprehended during the first six months of the year compares to 107,212 for all of Fiscal Year 2018 and 75,622 for all of Fiscal Year 2017. 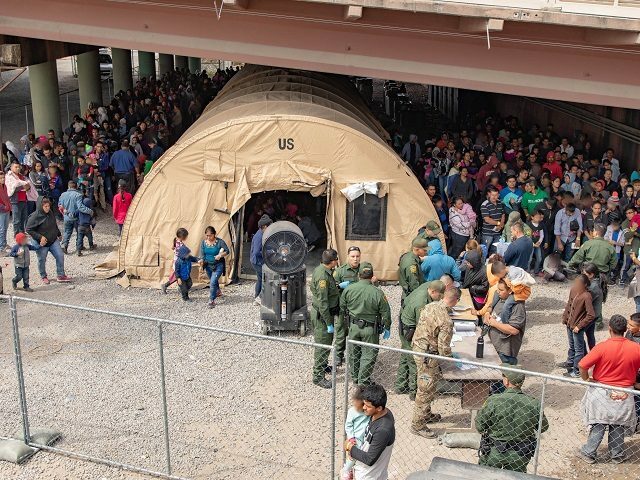 Due to overcrowding, Border Patrol began directly releasing non-criminal migrants on their own recognizance to nonprofits, charities, or to bus stations. Since the new policy began on March 19, Hastings said that more than 11,000 have been released. All migrants undergo a criminal background and medical check prior to release. The relatively new human smuggling tactic of crossing migrants in large groups is also negatively impacting the agency’s ability to prosecute its national security mission. Border Patrol defines a large migrant group as more than 100 migrants. So far this year, Border Patrol agents have encountered 100 large groups — 60 of those in very remote areas. During all of FY 2018, Border Patrol agents only encountered 13 large groups — only two in FY 2017. During a two-day period in March, Rio Grande Valley Agents encountered seven large groups totaling nearly 900 migrants between them. The largest number of migrant family units apprehended so far this year came to the U.S. from Guatemala (90,447). This is followed by Honduras (72,728), El Salvador (17,396), and Mexico (1,573). For Unaccompanied minors, 16,392 came from Guatemala, 9,138 from Honduras, 5,024 from Mexico and 4,479 from El Salvador.